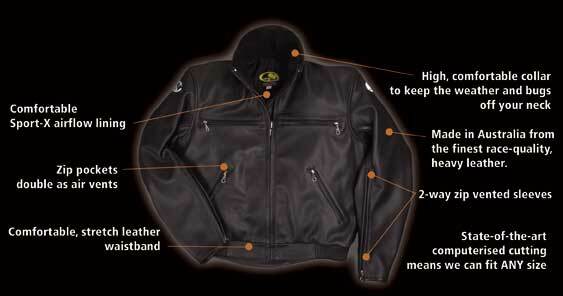 The Raven jacket is stylish enough to wear anywhere, yet it is a fully featured motorcycle jacket. A high leather lined collar keeps the wind out when riding and folds down when off the bike. Stretch shirring panels in the waist band keep the jacket snug around your waist without the need for buckles that can scratch the petrol tank. Action back construction gives an easy reach to the handle bars. Venting via Sport-X lined zip pockets and dimpled foam back pad allows cooling airflow in the heat. Manufactured from 1.4~1.6mm shrunken grain cowhides.